Learn about stuffed blacktip sharks. Guess what? If you need a blacktip reef shark stuffed animal then I have great news for you. You swam through the depths of the internet and found a great selection of stuffed blacktip reef sharks and plush blacktip reef sharks. Excited? Here's a tip, just because these stuffed animals are blacktip reef sharks doesn't mean that you can use them like an old quill pen. They're for imaginative fun, not for writing on old scrolls. Of course, what you do with your stuffed blacktip reef shark is up to you but there are much better ways to keep a sailor's journal about all of the great fun and adventure that you and your plush blacktip shark are sharing. Ever heard of a blog? Sure, Captain Ahab didn't have one and neither did Gilligan, but think of the trouble they could have saved themselves by constantly updating an online travel blog. The Professor really should have thought of that. Professor of what? Obviously not web technology. 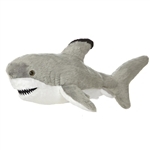 I digress, the important thing here is that you scroll down and have a look at our wonderful blacktip reef shark stuffed animals and get on with your seafaring adventures. Just don't forget your laptop!